Montréal, July 29, 2018 - Saturday night's race held at the quarter-mile Edmonton International Raceway oval in Wetaskiwin, Alberta, was fast and furious and ended with Alex Tagliani coming home third in the LUXXOR 300. Starting seventh, Tagliani claimed fifth place from D. J. Kennington on lap 63 of the 300-lap affair and kept reeling in the leaders. Following the half-time break on lap 150, the Canadian Motorsports Hall of Fame driver was fourth, then moved to third place on lap 178 before taking the lead on the restart on lap 282 following the only race incident full course caution of the evening. The pressure was immense, and Tagliani's lead was short. Saturday night's LUXXOR 300, round 7 of the NASCAR Pinty's Series, was won by L. P. Dumoulin who took the lead from Tagliani on lap 284 and eventually crossed the finish line ahead of Kevin Lacroix with a margin of 0.762 seconds. 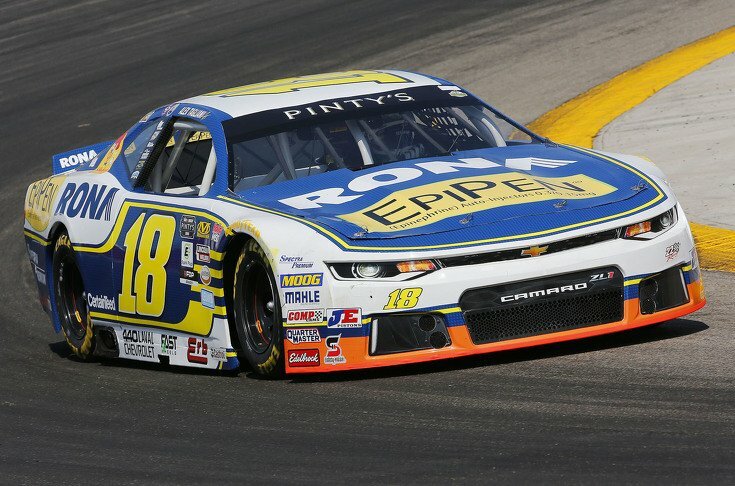 Tagliani drove his EpiPen/RONA/St Hubert Chevrolet Camaro ZL1 to third place followed by Cole Powell and D. J. Kennington. « We had another great evening of racing tonight," said Alex Tagliani. "Our trip out West has been fruitful with two top-three finishes in three races. We are still in the hunt for the championship title. I am quite pleased with work done by the 22 Racing crew on my car. The Chevrolet Camaro ZL1 EpiPen/RONA/St Hubert/Spectra Premium was a good third place car. I don't think we had a winning car tonight. On the last restart (lap 280), I was a bit surprised by the fact that Kevin (Lacroix) did not come out of the hole properly and slid on the outside. He opened the door and I cleanly came in on the inside. We hardly brushed, and I came out in first place. On the following lap, my car was brutally rear-ended by the eventual winner, who snow-ploughed me, but that is part of the game, he told me after the race. That hit is in the books, but overall, I am very pleased with the work done by the team. Next stop is Trois-Rivières where I am the defending champion." Seventeen drivers started the race with 14 crossing the finish line. Only five cars finished on the lead lap. The race was under full course caution twice for a total of 13 laps. The LUXXOR 300 will air on TSN on Saturday, August 11 at 1:30 p.m. ET. In the driver's championship race, Tagliani moves up two spots into fourth place, tied with D.J. Kennington with 270 points, 16 points behind new points leader L.P. Dumoulin. In 65 NASCAR Pinty's Series starts, Tagliani has six wins, nine poles, 26 top-fives and 43 top-ten finishes. The series will visit Quebec for the second time this season the weekend of August 12 when the town of Trois-Rivières hosts Le 50 Tours Can-Am on the famed street course of le Circuit de Trois-Rivières. Alex Tagliani is the defending winner of the event.